He’s the most expensive* player in the competition. Do you start him? Gaff (111), S. Coniglio (110), P. Cripps (109), and C. Oliver (109). All good players and all are worthy of the price. You can keep going down the list of midfielders in AFL Fantasy and you will see names such as J. Kelly, A. Treloar, S. Ross, E Yeo and so on. There were only 2 midfielders who averaged 120+ last year, the fantasy pig himself (T. Mitchell) and a Jack Macrae. If you review Macrae’s fantasy points over the last five years, he has been a very consistent player with a high ceiling. When he lost his status of DPP status last year (MID/FWD) many would have doubted that he could increase his average to anything past 110. In 2018, if you were one of the coaches that picked Macrae early on, you would have been rewarded. Those that follow me on twitter and from the conversations that I heard walking into Newsagencies, many coaches in the top 100 AFL Fantasy teams attributed their high ranking early on because they picked Macrae. From rounds 1 to 7 last year, his percentage ownership in the top 100 went from 1% to 19% and from there on, it was a matter of everyone trying to add him in to their team at a premium price. Even after his injury in round 13, by years end he was the second most picked player just behind T. Mitchell. As time unfolded, Macrae showed us that he was capable of consistent high output and he pushed that scoring ceiling to new heights. In round 23, he scored a whopping 190 points! If Macrae was a stock in the ASX, he turned from a speculative stock to a blue-chip stock and finally a blue-chip stock that gave fully franked dividends. Last year he broke that 120+ ceiling in 10 occasions. If you are looking for value for money, I’m sure you can find cheap midfielders that have a lot of potential upwards. If you are looking for a prime midfielder that is consistent and has a high ceiling, here he is. I certainly don’t want to step on the Pirates (@CalvinDT) shoes here, but if you are looking for captain reliable in the absence of T. Mitchell (129), you simply can’t ignore Macrae. He had 16 tonnes last year. His average of 122.6 included an injury affected score in round 13. His only other blemish was a 99 and 76, the later score was when he was tagged by Hutchings (WCE), say no more. On the 10 times that he scored 120+, his scores were 134, 128, 145, 151,155, 144, 133, 132, 124 and 190! He scored a 144 when he was tagged in Adelaide on a wet rainy night. Macrae as a fantasy player is a pure accumulator, his possession counts are elite. Even with a kick to handball average of 1.2 his fantasy scores last year were simply ‘delicious’. The fear of the tag. With the WCE winning the flag last year, will this set a precedence that a strong and close tagger is required to win a premiership? As with Titch last year, many coaches this year will have some fears about the hard tag on Macrae. He was tagged by Adelaide and WCE in rounds 9 and 18 last year. With scores of 144 and 76 respectively, there is not enough data to say either way on how he will handle a tag. Where he received some close attention from Hutchings (WCE) in round 18, Macrae was limited to 7 kicks which was considerably lower than his average (16) last year. Is Macrae the number one tagged player in the Western Bulldogs or will most team still tag M. Bontempelli? Another concern that coaches will have this year is his price tag. At 890K, he about 90K more expensive than player such as Gaff, Coniglio, Cripps, Oliver, Kelly and so on. Can you afford selecting Macrae when your balancing the books? There are strong arguments that you can spend the surplus 90K more wisely and appropriately. Is this the year that mid-price player madness rules? Certainly, Mr Back to Back himself @MoreirasMagic did not start with Titch last year and he still managed to keep up with the rankings and ultimately tie for that big prize. 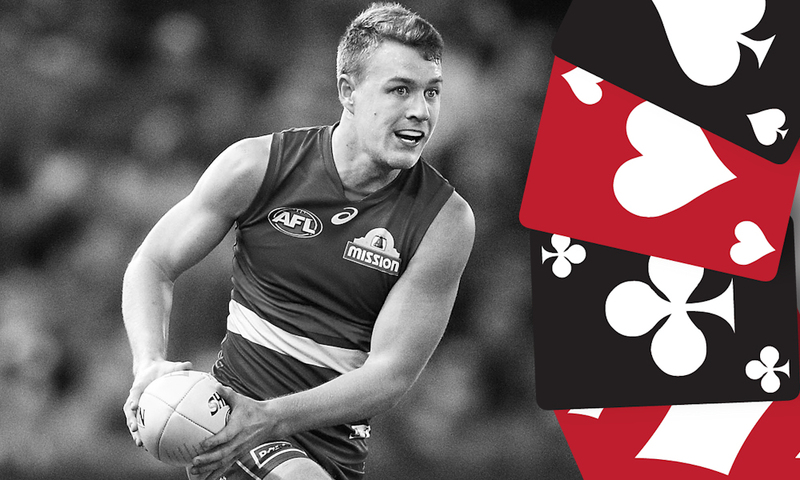 ACE – Macrae comes with a premium price tag because he showed us that he is a premium AFL Fantasy player. In the absence of Titch, I am predicting that many will start the year with him as the no 1 MID. If you are looking for a unique player and/or a cheap MID, then Macrae is not a ‘must have’. There are other ‘value for money’ players in AFL Fantasy that can fill that 110+ positions and is cheaper than Macrae. However, if you are after a set and forget midfielder, a must have vanilla, Macrae should be on the top of your considerations. He has the potential to go 120+ again and he can easily heal the wounds that most of us felt when T. Mitchell went down with a season ending injury early this year. What do you consider Macrae as? FOLLOW ME ON TWITTER: @ricontop for all thing AFL Fantasy (and more). Got something to say about the deck? Use the hashtag… #DeckofDT. 100% locked! I was planning on starting with Mcrae over Titch anyway. Macrae is 100% locked for me. I will also point out that the Bulldogs have a really friendly fantasy draw, particularly in the first part of the season. They start with Sydney, then a Mitchell-less Hawthorn, but then their draw opens up and they have Gold Coast, Collingwood, Carlton, Freo, Richmond and Brisbane in their next 6. He could come out firing. Watch him get tagged by Hewett rd 1 and Miller rd 3. Greenwood and Banfield to follow. Hewett did a number on Hunter last year and he’ll do the same to Macrae. I think it’s worth saving some coin and upgrading to him after the first month. The 99 he scored in round 5 last year was when he was tagged by Banfield. Upgrade target for me, too many other tempting options at lower prices. Macrae may score more points overall, but given his starting price (and a higher magic number again this year) I do not see his price getting up to levels that make him impossible to afford. The bulldogs midfield will bat a little bit deeper as it did 2016. Jack only managed 2 clearances per game in 2016 increasing to 3.9 in 2017 and 6.2 last year. No Picken and Liberatore last year and Bontempelli spent more time forward compared with 2016 and 2017. Jack averaged 104 wrapped around the the premiership year where he averaged 98 in a very even midfield group. He has a very even fantasy scoring game, however, only Hunter averaged over 100 in 2016. Think he may be an upgrade depending on the Bulldogs available midfield group at the start of the season? No Picken this year too. Libba will probably push Dunkley to a more outside role, can’t see it effecting Macrae. Macrae is over priced though and an upgrade target for me. Interesting read. As soon as Titch went down, I started looking for value – so I’m going to spread the cash out a bit further. Upgrade target for me.